Hofstra University offers Sikh Music courses and concerts. Hofstra University offers Sikh Music courses and concerts . Please note that we have managed to appoint Bhai Baldeep Singh (Delhi) and Dr. Gurnam Singh (Patiala) from India to be the unparalleled instructors and performers of these two courses and concerts. I would be very grateful if you could forward this exciting opportunity to study and hear Sikh Sacred Music to your students, family and friends - both courses and concerts are open to the public since they are held in the evenings. The concerts are free! This educational celebration and study of Sikh Sacred Music at Hofstra University is to create awareness about, and generate interest for, the appointment at Hofstra University of a Chair in Sikh Musicology in the near future - where such courses will be established as part of regular curriculum offerings. This Sardani Harbans Kaur Chair in Sikh Musicology will complement the existing Sardani Kuljit Kaur Bindra Chair in Sikh Studies to make Hofstra University the only university where both academic disciplines of religion (humanities, social science) and music (fine arts) are employed to study and understand the Guru Granth Sahib - a body of work that marries both cognitive and affective aspects. The Sardarni Kuljit Bindra Chair in Sikh Studies is endowed by Mr. Ishar Singh Bindra and family in honor of Mr. Bindra's wife and family matriarch, Sardarni Kuljit Kaur Bindra. The Chair is established to promote the academic study of Sikh religion, culture and history. 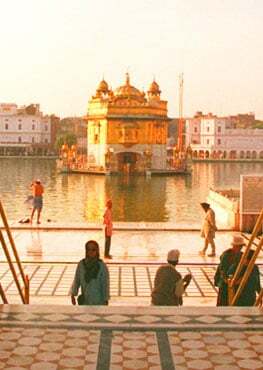 The endowment will support the appointment of a faculty member in Sikh Studies, build the University Library's holdings in Sikhism, provide scholarship assistance to students interested in Sikh religion and culture, and fund annual conferences and lectures directed toward the academic community as well as the general public. Mr. and Mrs. Bindra were born in West Punjab, now part of Pakistan. After completing a distinguished career as a senior telecommunications engineer in India, Mr. Bindra and his wife, Sardarni Kuljit Kaur Bindra, immigrated to the United States in 1979. Along with his sons, Mr. Bindra established an import/export business in the garment industry. Under his astute management, the Jeetish Group of Companies has evolved into a successful, diversified enterprise with interests in apparel, commodities, real estate and hotels. Ishar Singh Bindra is a founder-trustee of the Sikh forum of New York and senior vice president of the Sri Hemkunt Foundation. He has a rich and continuous record of accomplishments in communal affairs and has been a leading supporter of various humanitarian endeavors. He was honored by the Nargis Dutt Memorial Foundation, a nonprofit organization devoted to the support of medical facilities in India. He is also the first Indian to be honored as Humanitarian of the Year by the Interfaith Nutrition Network, a nonprofit organization serving the hungry and homeless. Sardarni Kuljit Kaur Bindra, an individual of great personal warmth and exemplary kindness, has placed education at the core of the Bindra family's values. Mrs. Bindra was so devoted to the education of her seven children that she sold her personal jewelry to allow them to attend the finest schools. She takes great pride in the fact that all of her children have distinguished themselves as professionals dedicated to Sikh values. For Mr. and Mrs. Bindra, the establishment of an Endowed Chair to promote the study of the Sikh religion is a natural outgrowth of their lifelong dedication to the propagation of educational values. Academic chairs are among the highest honors bestowed upon members of the faculty by the University and are regarded with great esteem throughout the academic world. Hofstra University is deeply grateful to Mr. and Mrs. Bindra for their generosity in establishing The Sardarni Kuljit Kaur Bindra Endowed Chair in Sikh Studies.